As the emigrants crossed Eastern Oregon on the Oregon Trail, some stopped to look for gold, others stayed to ranch, farm, or harvest timber from the forests. Never very numerous by the standards of their western brethren, Easterners spread themselves across an area so vast the most Eastern states would fit comfortably within its confines. 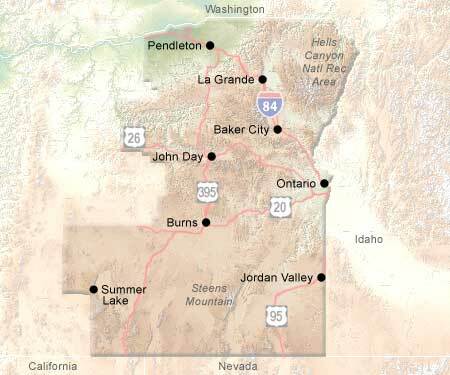 This is the real west, still populated today by cowboys and the location of vast, almost unpopulated areas. The opportunities for recreation of a different sort present themselves. Whitewater rivers can be rafted, wildlife viewed, and the wandering spirit can feel at ease in the open spaces. Several centers of population provide culture and commerce for the region as well. Oregon has more All-American Roads, National Scenic Byways, and Tour Routes than any other state. One All-American Road (Hells Canyon Scenic Byway), four Oregon Scenic Byways and one Tour Route are in Eastern Oregon.